John McCain lately knows something about being upstaged. The Republican presidential nominee's choice of Sarah Palin as his running mate has seen to that. Jokes about the "Palin/McCain" ticket are plentiful as she packs 'em in at her campaign events, barely survives those nefarious "mainstream media" interviews and basks in the afterglow of Tina Fey's dead-on impressions. Is "Sarah Barracuda" the biggest political celebrity in the land right now? You betcha. Meanwhile, McCain has company in this select grouping of Top 10 show-stealers from the TV series where they made their names. 10. EDDIE HASKELL (Leave It to Beaver, 1957-'63) -- "That's a lovely dress you're wearing, Mrs. Cleaver." 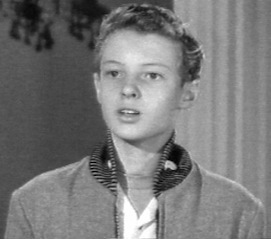 Prime-time's first punk kid, played by Ken Osmond, didn't mean a word of it, of course. But big brother Wally's sandbagging best friend made phony flattery his calling card while otherwise spiking "The Beav" as an irksome "Squirt" and worse. As in, "Wally, if your dumb brother tags along, I'm gonna-- 'Oh, good afternoon, Mrs. Cleaver. I was just telling Wallace how pleasant it would be for Theodore to accompany us to the movies.' " You had to love him. 9. LATKA GRAVAS (Taxi, 1978-'83) -- The acclaimed ABC comedy also had strong contenders in Christopher Lloyd's crazed "Reverend" Jim Ignatowski and Danny De Vito's sourball Louie De Palma. But I'll take controversy-steeped Andy Kaufman's recurring acid-trippy turns as "foreign man" Latka Gravas. Not that he stayed in character. Latka's multiple personality disorder gave Kaufman free reign to morph into anything his mind could imagine, including super-sexist Vic Ferrari. His death just a year after Taxi's cancelation was widely thought to be just another trick from his gag bag. Amazingly talented and tragically flawed, he burned bridges to the end. 8. B.A. BARACUS (The A-Team, 1983-'87) -- Onetime big-screen leading man George Peppard had the marquee name as cigar-chomping Col. John "Hannibal" Smith. He called the shots as bossman of this right-wronging, four-member collection of railroaded, disaffected Vietnam vets. In a flash, though. bejeweled, growling B.A. 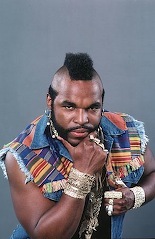 "Bad Attitude" Baracus (played by former bar bouncer Laurence "Mr. T." Tureaud) made the show his own star vehicle. More cartoonish than the show itself, he quickly disarmed viewers with the tagline that still defines him -- "I pity the fool." B.A. otherwise pounded the stuffing out of bad guys -- but in an oddly nice way -- while losing his temper on less than a moment's notice. Just a big teddy bear. Grrrrr. 7. ALEX P. KEATON (Family Ties, 1982-'89) -- Completely unknown at the dawn of the show, Michael J. Fox accomplished the seemingly impossible in a network prime-time sitcom. His portrayal of an aggressively conservative, avowedly Republican, William F. Buckley-worshipping 17-year-old was viewed as almost endearing rather than blasphemous. OK, maybe he was just being tolerated by a mass audience that made Family Ties a big prime-time draw. It didn't hurt being cute, of course, which quickly made Fox a teen idol, too. NBC also made sure to outnumber the kid with a mom and dad whose "flower children" pasts made them wonder just where they'd gone wrong with this oldest of three children. Alex P. persevered, though, secure in his skin, dress shirts and ties. Most viewers laughed with him, it seemed. That's almost a Mission: Impossible in today's super-polarized times. 6. ALEXIS CARRINGTON COLBY (Dynasty, 1981-'89) -- She first arrived in spring 1981 as a veiled mystery woman and surprise witness for the prosecution in oil tycoon Blake Carrington's murder trial. Viewers had to wait until the beginning of Dynasty's new fall season to learn she was flamboyant, devious, vengeful Alexis Carrington Colby, ex-wife of star John Forsythe's big Blake. Joan Collins, never known for downplaying a scene, became the show's showy she-devil diva, supplanting incumbent wife Krystle as Dynasty's go-to female character. Their free-swinging brawls on muddy land and in lily ponds provided this blue-blooded soap with some of its greatest hits. Joan's arc as Alexis was as priceless as the character's now impossibly gaudy wardrobe. 5. 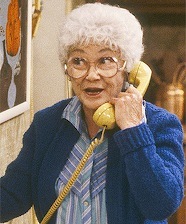 SOPHIA PETRILLO (The Golden Girls, 1985-'92) -- A salty stroke survivor who bedeviled her divorced daughter, Dorothy (Bea Arthur), Sophia spoke with the subtlety of a jackhammer. Set-in-her-ways, she spoke her addled mind without any stop signs to brake her. "You know something," Sophia once said to no one in particular. "When I turn my hearing aid up to 10, I can hear a canary break wind in Lauderdale." The role transformed Estelle Getty from little-known stage actress into scene-stealing Emmy-winner. Arthur, Betty White and Rue McClanahan were the marquee stars of the show. But Getty soon became the little dipper who outshone them all. Viewers waited patiently for her to walk on and walk off, invariably leaving a few verbal stink bombs behind. Getty died this past July, leaving a lone indelible TV character behind. Say no more. 4. 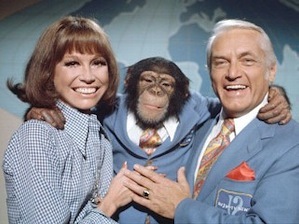 TED BAXTER (The Mary Tyler Moore Show, 1971-'77) -- WJM-TV's super-vain news anchor explored new vistas in pomposity while bungling through his nightly, malaprop-prone newscasts. He had a George W. Bush grasp of the English language, flub-a-dubbing without ever being the wiser. "Put it on an 'idiot card' for Ted," news director Lou Grant (Ed Asner) once ordered. "Cue cards, Lou," Ted said by way of correcting him. "I don't know why everyone insists on calling cue cards 'idiot cards' " Self-realization never dawned on Ted Baxter. The character made an instant star of Ted Knight, who from then on found himself trapped neck-deep in goofball heaven/hell. At that point, no one would buy him in any other guise. Knight died in 1986, adding Caddyshack to his quiver before calling it a day. 3. BARNEY FIFE (The Andy Griffith Show, 1960-'68) -- The show's namesake star likely didn't mind at all that Don Knotts quickly overshadowed him as Mayberry's inept deputy dunce. Griffith, as Sheriff Andy Taylor, willingly made himself the show's unflappable, homespun straight man. Knotts' Barney Fife got most of the laugh lines, driving them home even harder with his jittery body language and pipsqueak bravado. Knotts won five consecutive acting Emmys as Fife while Griffith was never once even nominated for holding the show together. Knotts stole scene after scene, which is exactly what was required of him. Absent Andy, he eventually found a nest egg as easily duped landlord Ralph Furley on Three's Company. No one wants to remember him that way, and hardly anyone does. It's Barney Fife who lives on. And he still just keeps getting better. 2. 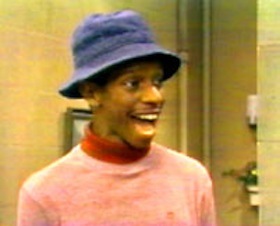 JAMES " J.J." EVANS, JR. (Good Times, 1974-'79) -- While top-of-the-cast veterans John Amos and Esther Rolle festered, Jimmie Walker's scheming teen exploded on the scene with his catchphrase, "Dy-No-Mite!" He spouted it like a Pez dispenser, making oldest son James "J.J." Evans, Jr. both a constant irritant to his parents and a surefire laugh magnet. Amos quickly tired of this drill, quitting the show while its writers dispensed with his character, James Evans Sr., in a fatal car accident. Rolle, who played Florida Evans, later dropped out for a season, contending that J.J.'s jive demeanor and get-rich-quick gambits made him a poor role model for young blacks. Walker stayed in place while his star power gradually shorted out. He was a quintessential one-hit wonder, emerging from nowhere to take over a show as few ever have. But that was then. 1. ARTHUR "FONZIE" FONZARELLI (Happy Days, 1974-'84) -- Strange but true. 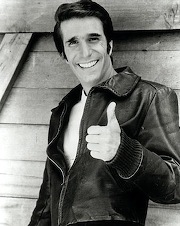 Henry Winkler's thumbs-up, leather-jacketed motorcycle "greaser" initially had less going for him in the scripts than Anson Williams' "Potsie" Weber or Donny Most's Ralph Malph. That changed in a finger snap when "The Fonz" first swaggered into Arnold's Drive-in and proclaimed "Aayyyy!" Oh happy days for the show's popularity and for Winkler, who eventually vaulted from fifth to first billing after star Ron Howard left the show in 1980. The set-in-Milwaukee, 1950s era sitcom became a kingpin in the prime-time ratings, with the first sighting of Fonzie in any given episode inevitably triggering a reflexive "Whooooo!" from the studio audience. When Fonzie got a library card, thousands of impressionable viewers reportedly did likewise. His leather jacket long has been enshrined in the Smithsonian Institution. And in mid-August of this year, the city of Milwaukee officially "bronzed the Fonz" during a ceremony dedicated to his lifesize statue. Winkler, happily in attendance, of course gave a thumbs up to what he called "this amazing honor in my life."